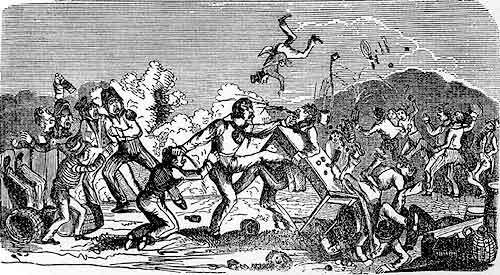 The first four American Colonies, starting in the 1600's, had some pretty serious barehanded fighting that still influences how we think about fights today. The first type of fighting was called a "Fair Fight" or sometimes "Queens Rules." It later became known as Kid-glove Boxing because of the soft goat skin gloves they wore. One was carefully regulated and elaborately staged in annual tournaments. The burly contestants commonly dressed in sleeveless vests, long tights tucked into stockings, and velvet trunks incongruously embroidered with delicate flowers. It was a throwing game. If any part of your body besides your feet touched the ground you lost the bout. Mixed Martial Arts..."is humanity itself compared with the Virginian mode of fighting," with its "biting, gouging and...you get the idea.